Home » Banner Cost Calculator » Calculate » Calculator » CPM Calculator » CPM Cost » CPM Rate » How to Calculate CPM Cost? How to Calculate CPM Cost? To Calculate CPM , Marketers first state the results of a media campaign (gross impressions). Second, they divide that result into the relevant media cost. Online Advertising - If a website sells banner ads for a $20 CPM, that means it costs $20 to show the banner on 1000 page views. 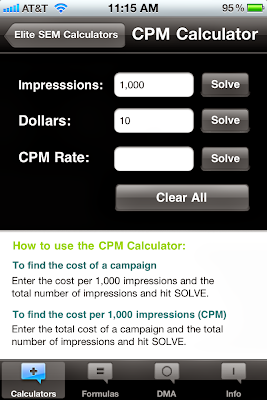 CPM Calculator Metric - is to compare costs of advertising campaigns within and across different media. A typical advertising campaign might try to reach potential consumers in multiple locations and through various media. The cost per thousand impressions (CPM) metric enables marketers to make cost comparisons between these media, both at the planning stage and during reviews of past campaigns.